In the video “why study Shakespeare?” Some of the reasons why Shakespeare is still studied in school today are to help kids learn and give them a way to discuss certain things that give them distant in a way if they are talking about certain situations like racial incidents to learning from foreign history. My reaction to what the presenter is saying is I agree with the presenter and why they say Shakespeare is still studied today because now today in my own class we used Shakespeare before to have group circles and talk about certain issues around the world and what happened in history and Shakespeare has kept us calm and able to talk and discuss certain things without any problems. The Shakespeare play we are studying is Othello, My strategies of understanding the play are connect it back to my day to day life and certain events that I have been through in my life that is somewhat similar to the dramatic scenes of the play. 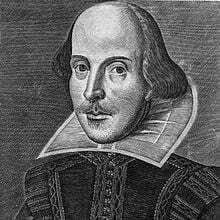 1-10 with my confident level on the language of Shakespeare I will say I am an 8.5, I feel this way because I am still getting the hang of the words and trying to fit the right words with the right meaning of what my generation are using. Shakespear Kemonjie by Kemonjie is licensed under a Creative Commons Attribution-ShareAlike 4.0 International License.